Join us on Fridays starting October 19th through December 7th from 12:00-2:00 for a unique way once a week to spend lunch- time learning. 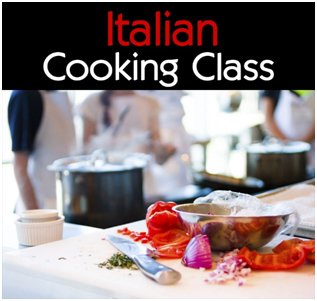 Seven week Italian cooking class with Evelina Santaguida. Come discover the secrets of Italian flavors and aromas! Evelina will be dedicating 2 classes from each of the three regions of Italy; the northern, central, and southern regions. The last class will be dedicated to the art of making Pizza.